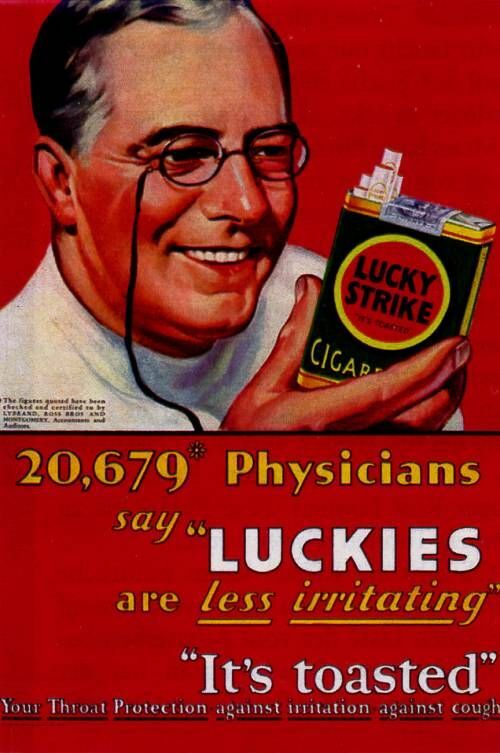 …Sure, dream on, that image is about as a false as the smiling doctor on a Lucky Strike package. The sad reality is that it is me who should be wearing the anti-pollution mask! I am stuck in a tight valley offering among the poorest air qualities in Europe. The levels of certain chemicals and harmful particles in the air are not only illegally high but have already shown to have direct consequences on people’s health. Going cross-country skiing in Chamonix (inevitably along roads since the valley is narrow) on a cold winter day, you better think twice. I personally wonder if this physical exercise is doing me more harm then good? 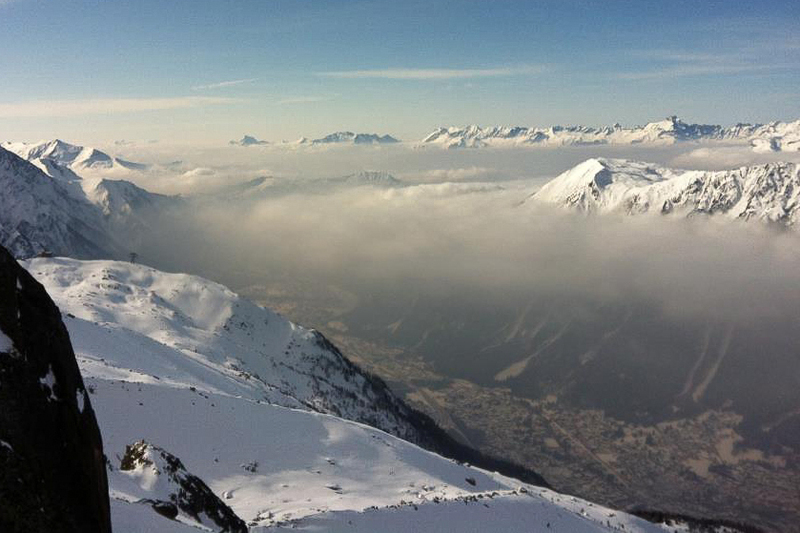 What Is The Story About Chamonix Air Pollution? The situation is very well explained by Gérard Decorps, professor and mountain guide at ENSA and representing FRAPNA 74, in a video published by TVmountain in mid-January 2012. In short he explains that the air pollution in Chamonix have been reaching alarming (as in illegal and harmful) levels for several weeks in a row now, and that the population and its local representatives are waiting for the authorities (more precisely Préfet de la Haute-Savoie) to do something to improve the situation. 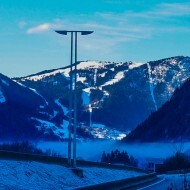 The negotiations between environmental and public health associations – demanding that the French law stating peoples right to breath a healthy air must be respected – and the authorities goes back 15 years in time, when the air pollution was first noticed to be a serious problem in Vallee de l’Arve. Finally in 2010, after the added pressure of a complaint signed by 33 doctors treating the valley’s population, the Préfet agreed to install surveillance stations and to make an action plan for when things get intolerable. 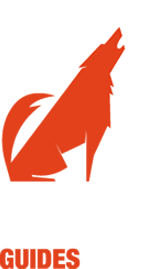 This plan (Plan Protection de l’Athmosphere PPA) has been made in cooperation between various associations and local politicians and has been accepted by the authorities to be effective from 1 Jan 2012. The PPA reaches several conclusions regarding; the most significant pollutants, how to measure their concentrations, and the measures needed to be taken in order to improve the quality of the air (during peaks of pollution as well as on a long-term basis). So people are monitoring the air pollution and reporting intolerable values (well above the recommended European standards), but none of the planned measures are being imposed. The ones in power of this region are wasting a lot of work put in by competent individuals and organizations. The fact that the Préfet has reinforced none of the measures mentioned in the PPA is the reason for Mr Decorps’ (tenth or so) letter to the Préfet 9 Feb 2012. How this man can maintain such a gentle and polite tone in his complaints goes beyond tolerance and patience. Can it really be true that absolutely nothing have been done?! Oh well, currently they kindly ask people to lower their speed with 20km/h when driving on the Autoroute Blanche – What a courageous and radical measure imposed by the authorities, I’m impressed now! The levels of NO2 and PM10 has been exceeding allowed European levels for months now, and one plan after the other of possible measures is being ditched or ignored due to its short-term unprofitability (I assume). 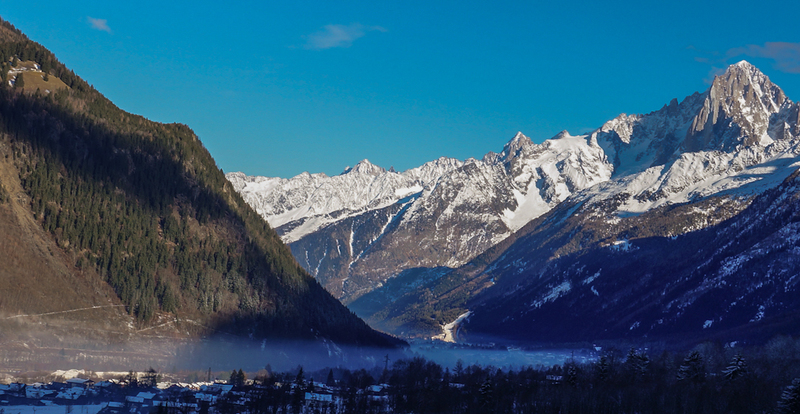 The situation is so bad that the EU court is threatening to sue Chamonix on up to 30 million euro for endangering the health of its inhabitants. If that money cannot be invested in something more useful then a penalty to the EU apparatus, it is due to a serious lack of initiative. Below is my interpretation of the facts/research presented in the Atmosphere Protection Plan (PPA) in Sep 2011, and some other sources linked to, mixed with my own comments. Some things might already have changed and for sure there is a lot that I do not know, so I’m happy for any comments or corrections! 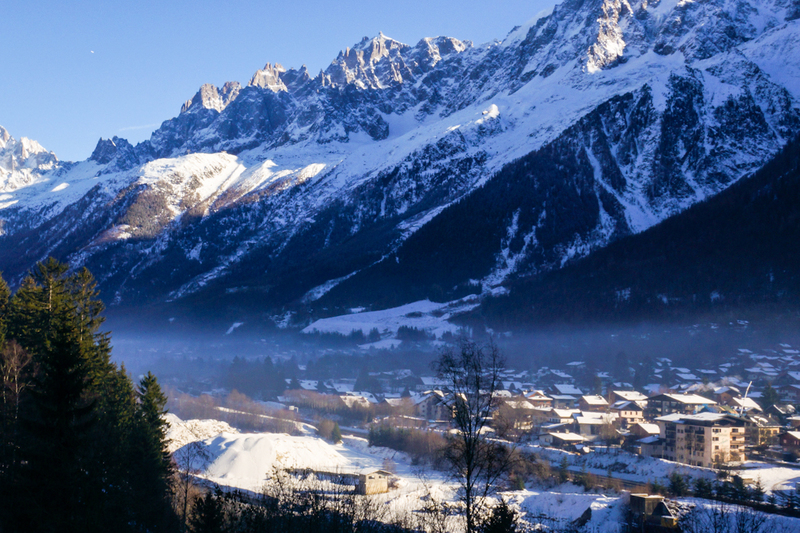 What Exactly Are We Breathing in Chamonix? The pollutants regulated by European laws are: NO2, PM (particles in suspension), BaP (benzo(a)pyrène), SO2, CO, O3, metals et benzene in the air. 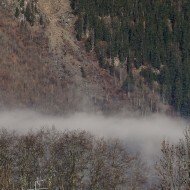 Four observation stations in the Chamonix Valley (representing urban, industrial, road-side, and altitude environment) are active and reporting the concentrations of the above molecules in the air. Airborne Particulate Matter, size <10µm (PM10): Very small particles in suspension, penetrating deep into your lungs. Coming mainly from the heating of buildings by burning wood, but also from burning of organic (green) waste in the gardens, as well as vehicles and industry. Simplified 50% of the particles are residential (wood-heated houses and garden fires), 25% industrial and 25% transport. The industry’s part of it is coming from small to medium size companies, SGL Carbon being the worst. CO and SO2 are of the same origin, but PM10 is the indicator that reaches alarming values most often. Peaks of PM10 exceeding the recommended limits (set by EU) are observed way more often then the yearly allowance of 35 days. The 35 days of too high PM10 concentrations had already happened as early as in March 2011. And this year will be a new record, did we possibly make it during the first 35 days of the year?! Benzo (a) Pyrène (BaP) is an infamous, cancerous organic compound, which is part of a larger group of Polycyclic Aromatic Hydrocarbons (PAH), many regarded as air pollutants. Especially in Passy BaP is frequently reaching unhealthy concentrations. The PAH pollution is also contributed to the industry in Sallanches and wood-fired heating of houses. Nitrogen oxides (NO and NO2) are inorganic gases formed from the N and O in the air when fuel is being burned. 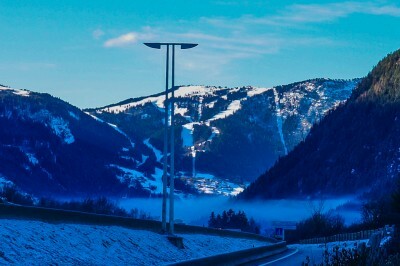 Levels are constantly exceeding healthy values in approximates to the roads, being worst along the Autoroute Blanche between Sallanches and into the Mt Blanc tunnel. Lorries pay a big role here, proved by the augmenting of NO2 during the progressive reopening of the tunnel in 2003. 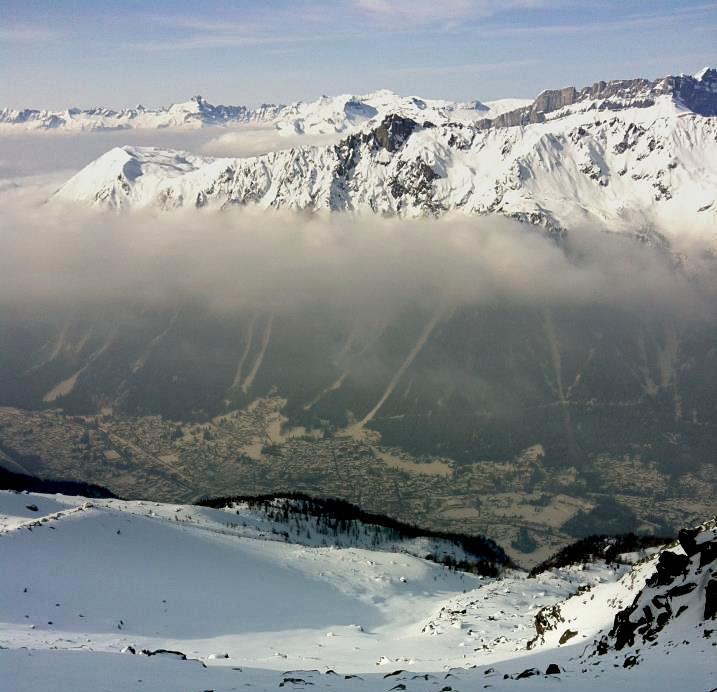 However the heavy traffic is only locally affecting for example les Bossons, but not central Chamonix. The regular hourly pollution-peaks causing the alarms in Chamonix town are due to urban traffic (especially weekends and end of the year holidays). Ozone (O3) is a secondary pollutant formed from NOx and Volatile Organic Compounds (VOC) in presence of sun radiation. It is found within large distances of the direct pollution (where it actually persist longer since it is also degraded by NOx). The highest concentrations of O3 are being measured on Aiguille du Midi (where alarming peaks are registered throughout the year) favored by the strong sun radiation in the high Massif du Mont Blanc. But also in Chamonix town the critical limits for O3 are exceeded during more days then allowed every year, especially on hot and sunny summer days. 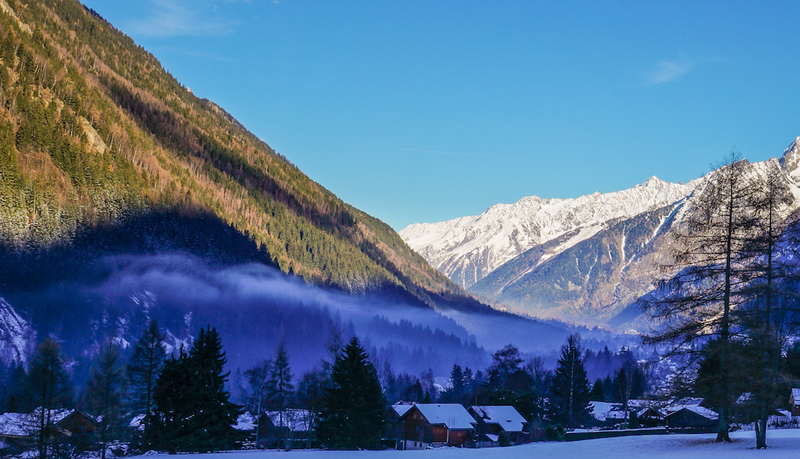 The failure to keep O3 levels within the set limits has been described as: Systematic violation of the public health regulations, not to mention the complete disrespect of environmental agreements supposed to provide a minimum of protection for the fragile alpine ecosystem. 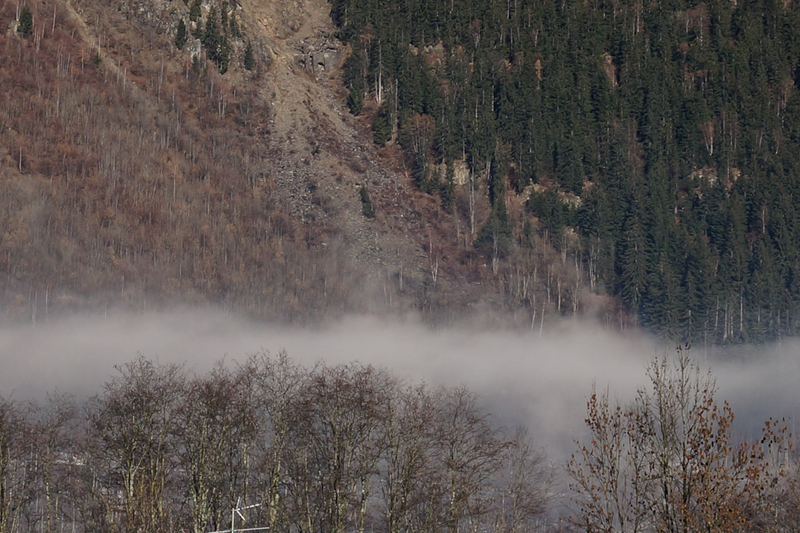 How Can the Chamonix Valley Sometimes Be More Polluted Then Paris? Vallee de l’Arve is an important passage for the transportation of goods as well as tourists going to the mountain resorts. But also inhabitants and industry is dense. Still pollution in the lower parts of Valle de l’Arve (Bonneville, Roche-Sur-Foron) is not reaching alarming values too often, but rather higher up towards Chamonix where the topography and climate is different. 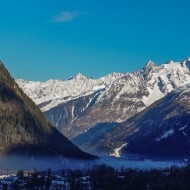 The part of Vallee de l’Arve stretching from Sallanches to Chamonix has been contributed the Worst Air Quality in France (more precisely the commune of Passy) by a liberal journal already in 2008, and thereafter Passy has been figuring on numerous occasions as a persisting candidate for this title. As the valley gets narrower and higher in altitude, habitats, industry and roads get highly concentrated at the valley floor and the climate gets colder. 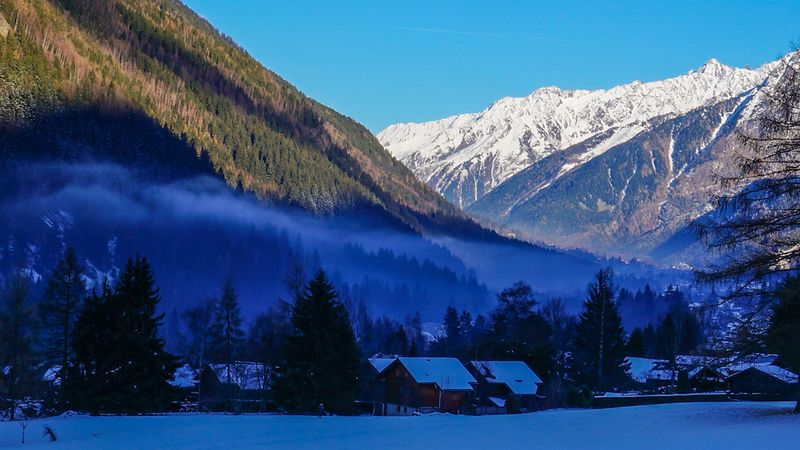 In winter the heating of houses is more intense and the air mass is often very stable, since it is protected from wind and often captured by temperature inversion. This hinders the air to rise and circulate, thus the diffusion of the pollutants is slower and their accumulation in the lower atmosphere is favored. This is the main reason why this area is extra sensitive to air pollution. The bad air quality is associated with cardio-vascular and pulmonary diseases in the population, such as asthma crises, damage to lung capacity and the bronchial system, as well as increased cancer rates. Irritation, coughing and sensitivity to inflammations in the respiratory apparatus are widespread symptoms. See the short presentation of health effects caused by each pollutant. Of course elderly and children are the main victims here. For example, kids have been checked since birth in Passy and do show abnormal signs of developing asthma. In Valle de l’Arve the main concern is the long-term effects on public health due to chronicle exposure to high air pollution. Even when the norms are respected (i.e. the number very high pollution peaks are reduced) it is probably the base level of air pollution that has the biggest effect on people’s health and mortality. And to answer my own question (about the cross-country skiing): Yes, red/alarming level of air pollution is an incentive to athletes to cease their out-door training, and for children and fragile persons to stay inside and shut the windows! The measures discussed in the PPA are of two characters, temporary and constant regulations. 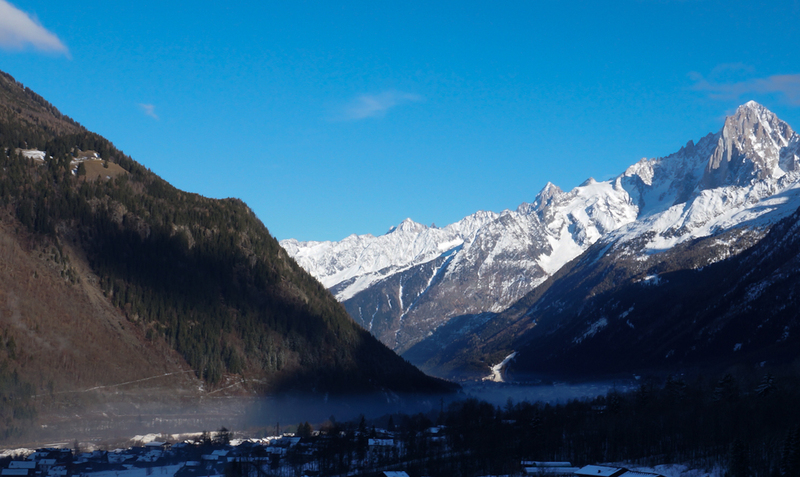 * Stop all wood heating systems that do not possess cleaning filters, unless they are the exclusive means for heating in a building: Unfortunately it has been extremely cold in Chamonix the last few weeks so all heating has been running on full gas. 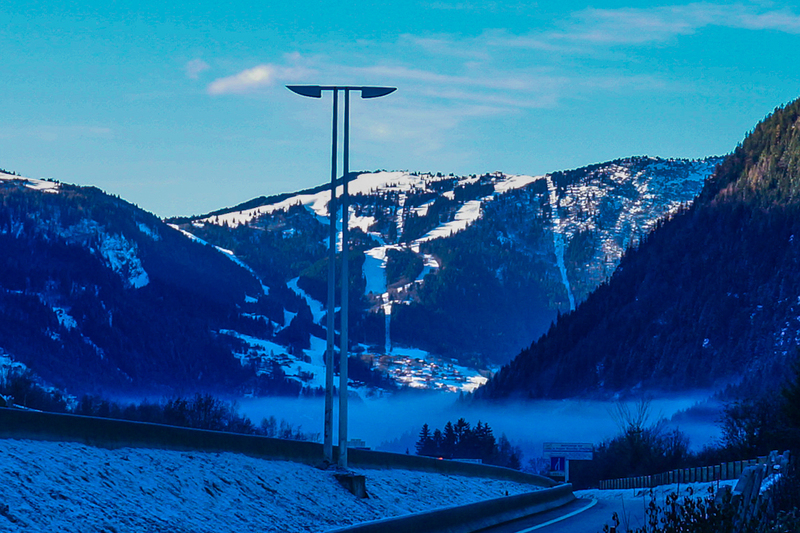 * Limit the heavy traffic through the Mt Blanc tunnel by redirecting the traffic to Vallée de Maurienne, unless they are also facing a critical period of air pollution, in which case the traffic can be limited during the night. 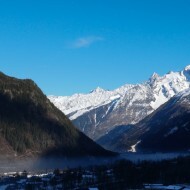 However, blocking the heavy traffic through the Mt Blanc tunnel is like dumping your rubbish in your neighbors bin, it only moves the problem to another valley, unless it is combined with an obligatory redirection towards a train tunnel, such as the car-train service AITON (Charmbery – Turino). So far environmentalists in gas masks from the ARSMB are the only ones to have blocked the Autoroute Blanche (Dec 2011). They suggest a permanent interdiction for Euro class 2 and 3 vehicles to use anything but trains when traversing the Alps. * Reducing the emission (PM10, PM2.5, HAP, COV) from combustion installations in the industry sector as well as private houses: Certain building projects in the valley are receiving financial support or tax reductions for installing or constructing sustainable heating systems, such as particle filters, solar panels and proper insulation of buildings. Some regulations of the industry emission have been imposed, for example SGL CARBON in Passy have been forced to reduce their outlet of certain particles by improving their facilities and processes. 1. Favoring the public transport by selling packages including accommodation + transport + ski pass: How about making sure that the busses and trains actually provide a good alternative that is also capable of supporting a larger public to start with? I mean, if the travel time and frequency of the trains was reasonably convenient.., if we didn’t have to worry about the one and only hourly buss being full and driving by without stopping.., if the bus lines were a bit organized to provide a reasonably quick transport from A to B (and not a sight-seeing circle around Chamonix town).., the attraction problem of public transport might just sort it self out without tricking tourist to buy packages that completely lack functionality. 2. Improved public transport, construction of biking roads and side walks, plans for the larger companies to transport their employees (by car sharing etc), organized deliveries to the mountain resorts, and regulations of the traffic in winter, are actions mentioned but details and deadlines are undefined. Presently the only actions taken are adding some extra busses to the existing lines, occasionally decreased speed limits on the highway, and sporadic controls of the over-weight of the heavy traffic. A planned biking road through the whole valley so far reaches from Bonneville to Cluses and is currently trying to make its way through the bureaucracy in Sallanches. Biking in Chamonix is always unpleasant since cyclist must share the narrow roads with so many cars that are already fighting each other to get through, but trying to bike to town in winter is horrifying; throwing yourself over the snowy sidewalk every time a car wants to over-take, queuing among the cars with pollutants being shoved down your throat… Walking is not much better. On a typical winter afternoon when the snow turns to slush you’ll get about 20 mud-showers on your way from Chamonix to Le Praz. There is a single railway through the valley that has seen no renovation or improvements in 40 years, and the investments needed now seem to big to overcome. The promised renovation and doubling of the tracks (by Réseau Ferré de France, RFF) was abandoned when it stood clear that South Corea was to host the Olympic games in 2018. RFF then pulled out of the deal. TVG trains St Gervais – Paris could be a good reliever for the cars bringing the majority of the tourists to Chamonix, but TGV:s are very rarely offered (to shameless prices) by SNCF on this distance. A direct train St Gervais – Geneva would serve the many commuters working in Geneva as well as all the tourists and residents travelling between the resorts in Vallee de l’Arve and their closest international airport; A distance of 1h by car that today takes at the very best 3.5hours by train. This direct rail is also a very diffuse project, discussed for about 10 years and not to be expected in the near future. Alarming values means that pollutants have reached a concentration in the air that is affecting people’s health and the environment even at short exposures. When this is happening or is about to happen, the authorities are obligated to inform the public and take the measures necessary for air pollution to revert to acceptable levels. This message must include: where, what, how much, for how long, as well as symptoms and recommendations for people at risk. This would be as much work as the daily avalanche report for Chamonix town (probably one of the reason why it is nowhere to be seen). Informing the public has a price tag in the PPA, but it does not suggest how this is accomplished, which is a major problem since most of the suggested solutions rely on the information and voluntary (or control) of the public! Personally I would not have known unless I would have searched for the information myself. The local news paper has done a good job of acknowledging the situation, but considering that Chamonix has twice as many visitors as permanent residents, which of the vast majority are non-French speaking, I’d say most people missed the alarms, let alone understood what we should do to improve the situation?? Maybe none…everything seems impossible here. Even the Chamonix mayor stands crippled, begging on his bare knees for some higher power to safe his railway and close the tunnel! Who is in charge then? For a foreigner that will always remain incomprehensible, but here (as everywhere else) money is above whoever thinks he is in charge. In this case loosing the good image, loosing visitors, and thus money will eventually bring about change. The question is, how far does it have go before all parties can come together and realize that it’s game over when the resources are finished, nature and people gone..? The day we actually start wearing anti-pollution masks in the cross-country tracks and the tourist office is forced to put the same deadly warnings on Chamonix-valley-adds as on cigarette packages, it might be worth the investment already. My point is simply to provide the information that is hard to find, and adding another few pages to the pile of complaints on the table. 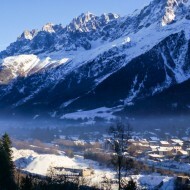 Tags: air pollution, Chamonix, responsible travel and sustainable tourism. The ‘law’ to move your car every 24 hours, despite being parked legally, is not helping. Why on earth is there not a charge to park at the bottom of the ski lifts in Argentiere, Les Houches and Le Tour. The ski buses could multiply on the money taken, people need to be educated by charge, then leave their cars parked. As for the leaf blowers…there is really no hope for Chamonix, it is only a cash cow, not a place to breathe.